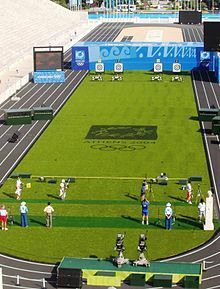 Archery competition held during the Athens 2004 Summer Olympics. Dropped from the Olympic program after the 1920 Antwerp games, it was reinstated in 1972. Àwọn eré-ìdárayá ìdíje Òlímpíkì ni awon ere-idaraya ti won dije fun ninu Idije Olimpiki Igba Oru ati Igba Otutu. Olimpiki Igba Oru 2012 ni ere-idaraya 26, be sini afikun yio ba iye awon ere-idaraya fun Olimpiki Igba Oru 2016. Olimpiki Igba Otutu 2014 ni ere-idaraya meje. The number and kinds of events may change slightly from one Olympiad to another. Each Olympic sport is represented by an international governing body, namely an International Federation (IF). ↑ "Olympic Sports, Disciplines & Events". HickokSports.com. 2005-02-04. Retrieved 2007-03-18. Àtunṣe ojúewé yi gbẹ̀yìn wáyé ni ọjọ́ 8 Oṣù Kọkànlá 2014, ni ago 04:39.